Weird – it feels like I just finished with Season Six of Star Trek: The Next Generation a few days ago, and here comes Season Seven. Oh wait – it really was just a few days ago! Combine my late start on Season Six with an early entry into Season Seven and I’ve barely given my player a chance to cool down between sets. Seven seasons and almost 180 episodes, all chowed down in a span of about seven months. That’s a lot of Trek to ingest in a short period, but it’s been fun. I’ll save valedictory comments for later, however, as now I should dig in to the programs themselves. As always, these shows will be discussed in the order broadcast, which is also the way in which they show up on the DVDs. For the fourth straight year, ended with a cliffhanger. “Descent, Part I” started the link between these two years, and Descent, Part II finished it. A discussion of the second show’s events would necessarily include spoilers for the first one, so I’ll just reiterate the synopsis I offered for that episode. The Enterprise intercepts a distress call from a base, and when they arrive, they find the Borg attacked it. However, these Borg seem different, as they don’t care about assimilation and they display other unusual behaviors. In addition, in the midst of the away team’s defense, Commander Data (Brent Spiner) gets mad, which manifests his first documented emotion. The Enterprise goes on patrol to try to deal with the rogue Borg while Data attempts to come to terms with his burgeoning feelings. Eventually, the two streams merge, as one manipulative captured Borg feeds Data’s desire to re-experience emotions. I preferred the intrigue of “Descent, Part I” to the resolution seen here, but the episode still finishes the saga in a fairly entertaining manner. On the positive side, the show makes more balanced use of the series’ main characters than almost all other programs. Each of our significant seven get to do something reasonably active, though a few personalities dominate. Overall, however, the episode seems a little flat, and doesn’t provide a terrific payoff for the scenario. In the end, “Descent” gives us good but unexceptional Trek. We see a cultural exchange in Liaisons. For the Federations first encounter with the Iyaarans, their Ambassadors Loquel (Paul Eiding) and Byleth (Michael Harris) arrive on the Enterprise, and Captain Picard (Patrick Stewart) will head to their homeworld. Counselor Troi (Marina Sirtis) and Lt. Worf (Michael Dorn) act as guides for the Iyaarans on board the Enterprise. Despite the ambassador’s obsession with food and fun, Loquel and Troi get along fairly nicely, but the pushy and demanding Byleth irritates Worf. In the meantime, the shuttlecraft run by Iyaarian Voval (Eric Pierpoint) runs into problems and crash-lands on a planet. Its sole resident Anna (Barbara Williams) saves him and the pair attempt to figure out how they can get off the place. Stuck there for many years, however, Anna seems to have some issues, and those complicate matters. 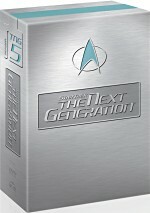 It seems like the first episode of a Next Generation season to follow the conclusion of the cliffhanger always takes on a more personal focus, and “Liaisons” follows that scope. After the broad emphasis of “Descent”, this program alternates Picard’s attempts to survive with the more comedic elements on the Enterprise with Worf and Troi. Though it tosses a few neat curveballs our way, “Liaisons” seems like a decent program, but it doesn’t become anything particularly noteworthy. For our first-ever look at the family of Lt. Commander Geordi La Forge (LeVar Burton), we go to Interface. Geordi’s VISOR system allows him to best operate a virtual reality-type interface for a new probe, and the crew plan to use this to explore the science vessel Raman, a ship that sent out a distress call. In the meantime, La Forge receives word that the Hera – which his mother Silva (Madge Sinclair) helms – has disappeared. Despite that upsetting news, La Forge still carries out his duty and works the probe on the Raman. All others give up on the Hera, but Geordi retains hope that the ship and his mom might still survive, and this feeling takes an unusual turn while Geordi works the probe. The family emphasis of “Interface” seems a little forced, but given the series’ low emphasis on Geordi during most of its run, I appreciate the attempts to fix this toward the end. Actually, he’s the only main cast member whose relatives never appeared before now. We know quite a lot about the families of Worf, Troi, Dr. Crusher (Gates McFadden) and Picard, and we’ve also learned a little about Commander William Riker’s (Jonathan Frakes) dad. However, I don’t think we ever heard anything about the La Forge clan before now, and that makes “Interface” fairly intriguing. Cool footnote: “Interface” offers a funky Roots reunion. Burton played the young Kunta Kinte in that program, and Madge Sinclair portrayed Bell, who married the adult Kunta. Their grandchild? “Chicken” George, depicted by Ben Vereen, who also shows up in “Interface” as Geordi’s dad. For the penultimate double-length episode of Next Generation, we find Gambit, Parts I and II. At the start of the show, the crew attempt to find a missing Picard, but they believe that they learn of his death in a bar fight. Riker takes over as acting captain, and he intends to discover who killed Picard. With the blessing of Starfleet, the Enterprise sets off on a mission to locate the aliens who allegedly offed Picard. After a while, they find a rogue band of mercenaries, and they capture Riker, who discovers some surprises on board their ship. He deals with those elements while the Enterprise chases after the mercenaries. “Gambit” starts slowly but gradually becomes pretty stimulating. The episode focuses on Picard, Riker, and the mercenaries, and these elements create some unusual aspects of the story. Many Trek programs feature this one’s style of bluffing, but few do so in such a heavy manner. “Gambit” provides an intriguing and lively piece, especially when we watch the interactions between Picard and Riker, and it seems like one of the series’ better programs. Trivia notes: “Gambit” features a crossover from a veteran of a Trek movie. Robin Curtis played Vulcan Lt. Saavik in Star Trek III: The Search For Spock. Here we see her as a Romulan. In addition, former basketball great James Worthy appears as the towering taciturn Klingon Koral. The ex-Laker proves surprisingly convincing in this minor role, as he makes Koral an amusingly unapproachable presence. In Phantasms we get some exploration of Data’s dream program. He experiences his first nightmare, and he then starts to go through some odd malfunctions. Speaking of which, La Forge installs a new warp core, but it fails to work properly. While the crew tries to get the ship’s engine back into operation, Data delves into his dream issues more significantly. Matters become trippier when he seems to go through nightmares while awake and he feels the urge to act on these images. One of the oddest episodes of Next Generation, “Phantasms” proves to be pretty cool. I feared it’d become too precious, as that occasionally happens during programs in which Data’s human side plays a strong role. However, “Phantasms” seems creative and absorbing as it delves into Data’s subconscious, and it offers a lot of fun. We see the final Next Generation appearance of Deanna’s mother Lwaxana Troi (Majel Barrett) in Dark Page. She comes aboard the Enterprise to assist in the instruction of the Cairn. Those people use telepathy to interact, but they want to learn vocal means of communication, and she helps with this. She introduces lead delegate Maques (Norman Large) to Deanna and hopes the two will connect romantically. However, matters complicate when Lwaxana starts to display erratic emotions and suffers from some breakdowns. She needs to avoid telepathy for a while because the experiences tax her, though it turns out that something else causes her trauma. Episodes that feature Lwaxana tend to be hit or miss, and “Page” follows suit. Actually, the show developed the character moderately well over the years, as she grew from simple comic relief to a more full-formed personality despite the fact she appeared so sporadically. “Page” broadens our knowledge of her telepathic skills and her history, and it seems reasonably interesting. However, it doesn’t do a whole lot to become anything special, and it feels like fairly average Trek. Right after “Phantasms”, it also seems a little soon for another program that delves into the subconscious. Future star alert: in one of her earliest jobs, we see Kirsten Dunst as Maques’ young daughter Hedril. Part of the planet Kes seeks associate membership in Attached. The Enterprise ventures to Kesprytt III to explore this, but the parts of the world occupied by the Prytt want nothing to do with this. Picard and Crusher beam down to meet with Kes Ambassador Mauric (Robin Gammell), but the Prytt intercept and capture them. That xenophobic and paranoid society thinks the Starfleet personnel seek to undermine them, and they plan to interrogate our heroes. With the help of a smuggled-in tricorder, our pair attempt to escape, while the crew on th Enterprise works with Mauric to find other means of aid. “Attached” takes an unusual turn in that it creates an artificial bond between Crusher and Picard. Devices implanted by the Prytt make them telepathically linked, so they get to read each other’s thoughts. This makes a fairly standard escape story more interesting, as the pair interact in a more intimate way. Given the moderate sexual tension that always existed between Picard and Crusher, this allows “Attached” to develop into a pretty positive program. The dangers of warp drive come up in Force of Nature. When the medical transport Fleming disappears, the Enterprise enters the Hekara Corridor to find it. That location is necessary for warp-driven ships to pass through the area, as otherwise natural forces will harm the ships. They encounter a disabled Ferengi craft, and they soon get shut down themselves when they meet a probe. The inhabitants of Hekaras II used these devices to stop ships so they could push their research concerns. Hekarans Dr. Rabal (Michael Corbett) and his sister Dr. Serova (Margaret Reed) claim that warp emissions are killing their planet, and after some research, Picard states that he’ll present their findings to Starfleet. That’s not good enough for the fanatical Serova, who uses more extreme tactics to push her case. Not a good episode but not a bad episode, “Nature” feels a little preachy and lackluster. It seems like a treatise on pollution in a way, and it doesn’t do much to expand the Trek universe or offer anything terribly stimulating. However, it also doesn’t appear dull enough to become a notably weak show. “Nature” offers one of those mediocre programs that doesn’t do anything particularly wrong, but it simply fails to take flight. Elements of Data’s past crop up in Inheritance. The government of Atrea IV anticipates a natural disaster because the planet’s molten core has begun to solidify. Part of the crew assigned to work with the Enterprise includes Dr. Juliana Tainer (Fionnula Flanagan), who we soon learn was once married to Dr. Soong, Data’s creator. This makes her Data’s “mother”, but since they wiped Data’s memory bank clean early in his life, he feels no memory of her. The pair get to know each other as Data learns different elements of his history. Though it seems interesting to learn some of these components, “Inheritance” feels much too much like a soap opera program. The complications of Data’s relationship with Dr. Tainer come across as excessively dramatic and forced, and the whole show appears gimmicky much of the time, especially as it piles on the plot twists. “Inheritance” offers some interesting moments, but the whole doesn’t do much for me. Worf encounters some funky memory problems in Parallels. He returns from a Klingon battle competition that he won. The crew throws a surprise birthday party for him, and Worf starts to experience some dizziness. After this, he finds that his memories seem to deceive. He forgets orders from superiors and finds that he recalls things that others don’t get. This occurs as the ship enters the Argus Array, which has ceased to relay data for the third time this year. Gee, you don’t suppose that the problems with the Array will somehow connect to Worf’s perceptual concerns? Things get trippier and trippier as the episode progresses. Much of “Parallels” seems a bit flat and predictable, but the third act offers some cool – if gimmicky – moments. Those allow it to become a somewhat above-average episode. Trivia note: “Parallels” provides our first view of Wesley Crusher (Wil Wheaton) since Season Five’s “The First Duty”. Riker encounters his past in The Pegasus. Admiral Blackwell (Nancy Vawter) orders the Enterprise to rendezvous with the Starship Crazy Horse for a mystery mission. When they do so, they meet with Admiral Eric Pressman (Terry O’Quinn), Riker’s first commanding officer on the Pegasus. The latter ship apparently exploded during a warp core breach 12 years earlier, but Pressman relates that it may still be out there and in the possession of the Romulans. Actually, they’ve not yet found it, so both crafts try to locate it. While the Enterprise searches for the Pegasus, we learn of a risky experiment that occurred on the Pegasus, and Pressman wants to push his luck again if they find the craft. Like the attempts to fix Atrea IV in “Inheritance” feels like nothing more than a method to explore Data’s past, the search for the Pegasus comes across like just an excuse to learn more about Riker’s history. Admittedly, the intrigue of the mysterious Pegasus makes this show more intriguing than “Inheritance”. Otherwise, “The Pegasus” seems somewhat ordinary, and it feels inevitable that every time we meet another high-ranking officer who comes aboard the Enterprise, he’ll act inappropriately in some way. The parts that deal with some shady aspects of Riker’s history add to his character, but the show generally seems a little lackluster. Interesting trivia note: “The Pegasus” explains why the Federation never used the cloaking technology enjoyed by the Romulans and the Klingons. We get another look at Worf’s past in Homeward, which introduces his adoptive brother Nikolai Rozhenko (Paul Sorvino). The Enterprise receives a distress call from Boraal II, a primitive culture with no knowledge of the Federation. Some atmospheric disturbances ruin the planet’s surface and send its inhabitants under the surface. Nikolai wants to act to build a miniature artificial atmosphere that will allow at least one village to survive, but Picard cites the Prime Directive and refuses to do this. Nikolai takes matters into his own hands: he creates a holodeck replica of a part of Boraal II and beams the people into it without their knowledge. The rest of the episode deals with the ramifications of this decision as well as Worf’s interactions with his brother. The family elements of “Homeward” feel a bit tired, as we’ve seen an awful lot of this sort of material. However, I like the explorations of the Prime Directive, as that topic offers some intriguing problems. The show’s philosophical issues make it reasonably compelling. Still more familial connections receive exploration in Sub Rosa. This starts with the funeral of Crusher’s grandmother on Caldos colony, a terraformed recreation of a Scottish village. Beverly learns that her nana had a much younger lover, the 30-something Ronin (Duncan Regehr), but a mystery surrounds this highlands hunk, as Crusher starts to learn of a ghostly presence that may present a greater danger. A fairly silly episode, “Sub Rosa” often feels like a Trek attempt at a cross between a horror flick and a romance novel. The faux Scottish setting makes it a little more interesting, but too much of the show comes across like a goofy ghost story. “Sub Rosa” offers one of Season Seven’s weaker programs. The Enterprise includes about 1000 inhabitants, but even when we consider recurring secondary characters like O’Brien and Guinan, the series concentrates on less than a dozen participants. Lower Decks explores the lives of few of its lesser lights, as we watch the interactions of junior officers Sito (Shannon Fill), Lavelle (Dan Gauthier), Taurik (Alexander Enberg), and Ogawa (Patti Yasutake), especially as they worry who will gain a promotion during crew evaluations. ”Lower Decks” gives us an interesting glimpse at life beyond the main crew. While intriguing, it doesn’t quite go far enough, as matters still emphasize our prime characters a little too heavily. Nonetheless, “Lower Decks” provides an entertaining examination of life beyond the big characters. In Thine Own Self, Data goes to Barkon IV to retrieve some radioactive material. However, something goes awry; he becomes injured and loses his memory. While in this problematic state, Data wanders into the planet’s pre-industrial society with the radioactive metal in his possession. As he tries to figure out who he is, the people start to get sick, though he doesn’t know why. In the meantime, Troi decides to take the test to receive a promotion to commander. While it seems somewhat interesting to see Data interact with these primitive folks in his amnesiac state, the episode suffers since we’re always so far ahead of the participants. Admittedly, I know the show’s producers didn’t expect us to wonder what causes the villagers’ illness, but since the program spends a lot of time exploring the issue, it gets a bit tedious. The elements that relate to Troi offer some interesting moments, but overall, “Self” provides a relatively weak episode.